Look up fillet in Wiktionary, the free dictionary. 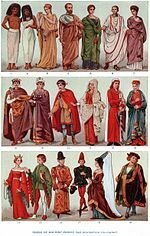 Later, in medieval times, a fillet was a type of headband worn by unmarried women, in certain monk hoods, usually with a wimple or barbette. This is indicated in the sign language of said monks (who took oaths of silence), wherein a sweeping motion across the brow, in the shape of a fillet, indicated an unmarried woman. Charioteer of Delphi, wearing a fillet headband, bronze statue (478–474 BCE).